KUALA LUMPUR (Sept 11): Malaysia's industrial production index (IPI) grew 0.5% in July this year from a year earlier, way below market forecast. In a statement today, the Statistics Department said the IPI's rise came on growth in the manufacturing and electricity output. Growth in both segments had mitigated the impact of the decline in mining output. According to the department, the IPI's manufacturing and electricity components grew 3.1% and 4.9% respectively. The mining segment fell 7.8%. During the January to July period, the IPI expanded 4.6% compared with the same period in the previous year. In monthly terms, July IPI fell 3.8%. July's 0.5%, on year, IPI growth came in significanly lower than the market's median forecast of a 4.3% expansion, based on a Reuters' survey. 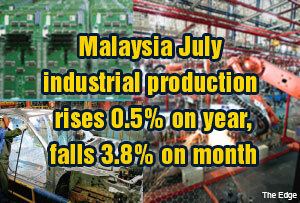 Earlier, Reuters reported that Malaysia's industrial output in July probably grew 4.3 percent from a year earlier in line with weaker exports during the Muslim fasting month of Ramadan. The median forecast from 11 economists for July was well below June's 7.0 percent annual rise. In a separate statement, the Statistics Department said Malaysia's manufacturing sales value grew 1.4% to RM54.8 billion from RM54 billion a year earlier. The increase in sales value came on higher sales of products including aluminium, besides electrical and electronic items. On a month-on-month basis, July manufacturing sales increased 2.7% compared with the preceding month. On a cumulative basis, January to July sales value expanded 7.7% to RM379.5 billion from a year earlier.